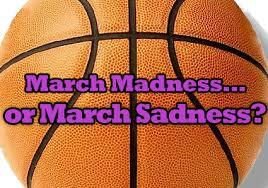 For the benefit of new readers I’m reposting my annual March Madness message. Please tell me I’m not the only person in the world who thought March Madness was about special annual retail sales—like Black Friday. For weeks leading up to the big event and for the duration, I keep waiting for the flyers from my favourite retailers to arrive in my mailbox. With visions of bargain-priced sugar plums dancing in my head I couldn’t wait to hit the mall to stock up on half-price underwear and my favourite jeans. Surely all the big cosmetics companies would be having extra-special promotions with yummy shades of lipstick in their give-aways. Excitement turned to disappointment when the media started talking sports in the same sentence as March Madness. My suspicions were verified when I asked my husband who gently explained that the “real meaning” of March Madness was the narrowing down of basketball teams competing for ranking in their respective cups—as in athletic. Yes, Virginia. There is a Santa Claus but not in March.